James D. Rector was the son of James D. and Rozella R. Rector and was born in Bend, Oregon on December 17, 1950. He had two brothers. He was married and had two children. Sergeant Rector graduated from Bend High School and then served in the United States Army during the Vietnam War. After completing his service he attended the police academy and was hired by the Oregon State Police on November 15, 1972. 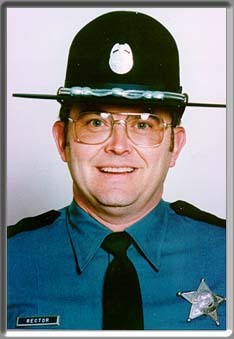 He was promoted to Senior Trooper on July 1, 1981 and to Sergeant on June 1, 1997. He was assigned to the Klamath Falls office from 1972 until 1976 and then was at the Gilchrest office. Sergeant Rector was very involved in crime prevention through Neighborhood Watch and DARE programs along volunteering with other community projects. He was Klamath County Police Officer of the Year in 1995 and received the Oregon Police Officer Medal of Honor for his involvement in a shooting. He had survived several other shoot-outs during his twenty-four year and two bullet wounds. The funeral for the two officers was held in Bend and attended by more than 2,000 mourners. They were both buried in the Pilot Butte Cemetery in Bend.